Ruckus is proud to announce that they were today named to the 2013 Agency 100 List, which celebrates advertising agencies that showcase “demonstrated fortitude, strong relationships, great work and strategic ideas.” Coming in at No. 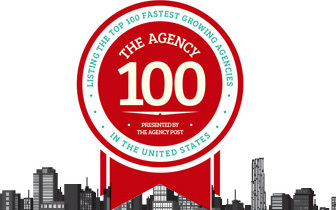 18, the listing compiled by The Agency Post recognizes the Top 100 Fastest Growing Agencies in the United States. Following the 2008 market recession, advertising budgets dwindled, spending collapsed, and many firms in the industry went out of business. Some, however, refocused, innovated the traditional advertising model, and turned their attention to redefining an agency as a partner that could impact top- and bottom-line client sales. Ruckus was among these agencies. To celebrate these innovators, The Agency Post – an interactive advertising, PR, and marketing publication – chose to highlight the top 100 agencies that have successfully grown their companies while continuing to meet their clients’ goals. By producing great ideas, a stable business model, and developing the most talented teams, the agencies on this list represent great client partners. Ruckus was founded in 2005 with the mission to bring discipline and sound business strategy back to the marketing and advertising industry. It’s often the case that big ideas are praised, but there is a resulting disconnect between the agency and client when there is little-to-no bottom-line revenue impact. To better serve clients and meet these evolving standards, Ruckus began to augment the sales process, create training programs, collaborate to reallocate budget, and drive change management for our clients. In the process, we rediscovered our mission and became a growth partner. Ruckus is excited to have made the 2013 Agency 100, and we look forward to continued success.